With complete coverage of Russia and 80% coverage of the world this Soviet Era project is coming near to an end with just six more satellites remaining to be launched. A navigational system needs 24 satellites in the orbit for the complete coverage of the world. This operational navigation system will allow Russia to move out of the dependency on fully functional american GPS. The need of such a system increased even more when Americans interrupted GPS signals for Russian troops when they invaded Georgia in 2008. Earlier the development of the project started as a military project amidst cold war and space and arm race with US in the late 1970s, but now it has been made a civilian project as well. During the Soviet times there were around 43 satellites orbiting the earth contributing to the GLONASS network, but after the fall of Soviet Union there were only 12 functional satellites in the space. The development of the project was obstructed by the fall of Soviet Union and socio-economic problems. Vladimir Putin’s initiative in 2000 brought the progress of the project to an upper step. Russian Scientists started working on this project from a new edge. Engineers started working on making better interface and receiver devices. To make it more accurate, it will use a two signal receiver which will support both GPS and GLONASS. Anatoly Perminov, the chief of Roscosmos, said in an interview with BBC that they are trying to reach towards a similar compatibly with European Galileo, Chinese Compass and Indian IRNSS. Another important step taken to make the development of the project fast was the deal with India. UIndia and Russia signed an accord in 2007 which allows India to use GLONASS’s military version, thus after Russia, India becomes the only other country to use its service for military purpose, in return India agreed to launch two satellites from its space station to join the GLONASS satellite system in space. Also the two countries signed an agreement to jointly develop a two signal receiver and other navigational equipments and devices. attention to the development of GLONASS. Though India’s own navigational satellites are ready to be launched in space, there is still a lot of time upto 2014 for the Indian IRNSS (Indian Regional Navigational Satellite System) to be completely functional. Also Indian version will not cover the whole world. It became necessary for India to find an alternatice for GPS when they came to know that Americans interrupted the GPS signals when Indians were testing the world’s only supersonic cruise missile. This interruption in signals by Americans led to the test failure showcasing the vulnerable dependency of Indian military on American systems. GLONASS navigational system has been launched in Russian market for civilians, though it didn’t attract good reviews due to its high price tag. The Russian major telecom operator company MTS launched a smartphone with GLONASS which some gadget freak called it an answer to iPhone also didn’t receive good reviews due to high cost and less appealing design. The reason for this could be that it is the beginning. With further development and improvement with customer feedbacks, the coming designs and models are expected to capture the market efficiently. New softwares and enhanced electronics with state of the art Russian technology, Russian GLONASS is said to be more accurate than its American counterpart. Also due to low strength of GPS signals in northern latitude, GLONASS becomes the only option for the northern countries in the world near to the arctic. 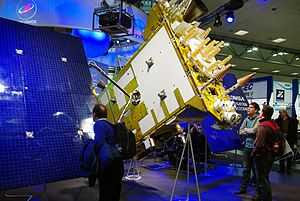 Russia is now considering enforcing a 25% tax on non GLONASS device, this is to encourage GLONASS in the country. Devices having GLONASS would be free of this tax. It is being reported that iPhone 4S will be bringing GLONASS feature to avoid an extra 25% tax.